Fast Response! We’ll clear the toughest clogs! When you have tried plungers, liquids and all the home remedies for drain cleaning with no results, you can always count on The Rooter Drain Expert! We are the Canyon Country plumbers and we are here to assist you. Hair clogs, grease clogs, roots clogs and all the clogs you can think of, we can clear. We have special industrial graded machines that will surely clear virtually any clog. If you want to learn more about our tools and our qualifications, we have taken the time to create dedicated pages for our tools in order to educate our customers. We are the Canyon Country Plumbers; we have been working with the community of Canyon Country for many years. We are the Canyon Country plumbers, we can provide you with good prices and excellent customer service that the big corporations cannot compete with. We have less overhead and that allow us to serve you better. We are a licensed plumbing company, we have all the permits the state of California requires to perform our services, all this to better serve you. Please take the time to read our informational page of “why it is important to hire licensed plumbers“. The plumbing system in Canyon Country is aging and we are seeing more plumbing problems each year. As your local plumber, we recommend preventive Camera Inspections. With our high-quality sewer cameras, we can help you discover potential big problems before they occur, saving you money and all the disturbances that come with big repairs. 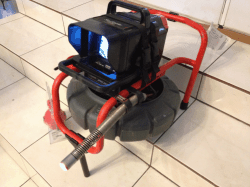 We have top of the lines Cameras that provide a clear view of the inside of your sewer pipe or any other pipes. We can make a DVD for your records. You can also visit our Plumbing Services page where you can see all the services we provide. The video above shows different problems that might be happening inside your pipes. Old clay pipes used connections every 3-6 feet creating weak spots were roots can invade and eventually cause a blockages. We work everytime it is needed with the city inspectors, and as the Canyon Country plumbers we know all the city regulations. We also know a little about the history of the Canyon Country city, and you are interested you can learn more at Wikipedia Canyon Country. If there’s one thing no homeowner wants to have to deal with, it’s a broken sewer pipe. When you do have a serious issue with a sewer line, however, it’s important to know where to turn. A plumber that provides trenchless pipe replacement can provide you with the fastest, most efficient, and least invasive solution to your sewer pipe problem. If you’d like to find out why trenchless pipe replacement might be the right option for your home, keep reading. Why do sewer pipes need to be replaced? Sewer pipes may be designed to last a long time, but they will not last forever. Sewer pipes can require replacement because of age and corrosion, damage from shifting soil or settling foundations, leaking seals, poor construction or low-quality material, intruding tree roots, or any number of other issues. If you have reason to believe that your sewer pipes may be ready for replacement, your plumber can inspect them to check on their current condition. How can I tell when it is time to replace my sewer pipe? You are experiencing repeated sewage backups. Your sinks, bathtub, or toilet are unusually slow to drain. You can smell sewer gas anywhere in your home. You notice cracks in your foundation slab. You find wet, soggy areas in your yard where the pipe is leaking. What is trenchless sewer pipe replacement? Trenchless sewer pipe replacement is a method of replacing your existing sewer pipe without creating a trench to access it. It is a safe, effective, and proven process that offers an efficient and eco-friendly alternative to traditional sewer pipe replacement. How can I know whether trenchless sewer pipe replacement is needed? Before replacing your current pipe, your plumber will need to inspect it to determine whether replacement is the best option at this point. To do this, your plumber will use a special waterproof camera attached to a flexible rod to find and identify the problem inside your sewer pipe. The rod allows the camera to snake through your entire sewer line and take up-close images of its current condition. The exact location of the problem will be recorded for future reference. What are the different types of trenchless technologies for replacing a sewer pipe? Trenchless pipe lining works by threading a new pipe into one end of the sewer line, effectively replacing the original one without removing it. To make sure the new pipe sticks in place, it will be coated with epoxy. Then, a camera inspection will be done to ensure that the new pipe is intact and stable for the entire length of the line. Trenchless pipe bursting works by accessing both ends of the sewer pipe, and then drawing a bursting head all the way through it. Since the bursting head is larger than the original pipe, it will actually break down the old pipe as it is pulled through the line. Then, a brand-new pipe can be pushed into the space. Before performing this procedure, your plumber will check to make sure that there are no nearby utilities that could be damaged by the bursting process. How do I know whether pipe bursting or pipe lining is the better option for my home? This largely depends on the condition of your pipe and how it is configurated. If your existing pipe is in poor condition or has completely collapsed, pipe lining will probably not be suitable. If your pipe is sagging, pipe bursting will not resolve that problem. Your plumber will inspect your current sewer pipe and tell you which of these two technologies will be a better fit. Which trenchless pipe replacement method provides better results? Both pipe bursting and pipe lining will provide you with a durable brand-new sewer pipe. The primary difference is which method will be more suitable for your sewer line, not which will provide a better outcome. What are the advantages of trenchless sewer pipe replacement? Traditionally, replacing a sewer pipe could not be done without actually digging up your yard. Not only was this a lengthy and tedious process, but it also meant damaging your lawn and disrupting the local environment. Once the new pipe was installed, it was necessary to repair the lawn and, often, replace expensive landscaping. Trenchless sewer pipe replacement, by contrast, can be performed with only minimal disruption to a person’s lawn. For that reason, it also tends to be a more cost-effective option for most homeowners who do not want to deal with the time and expense associated with restoring their yards after traditional sewer pipe replacement. If you are concerned about keeping your lawn as intact as possible, you want to keep the cost of your sewer pipe replacement low, or you simply want to have your sewer line replaced more quickly, trenchless pipe replacement may be your best option. Is trenchless sewer pipe replacement appropriate for my property? Trenchless sewer pipe replacement is not a viable option for every home. When you contact your plumber to inspect your sewer pipe, you will be able to get a professional recommendation as to whether trenchless pipe replacement is suitable for your property. Do you need to replace your existing sewer pipe? When you’re looking for a trenchless expert to handle your sewer line replacement in Canyon Country, CA, you can count on The Rooter Drain Expert. Our team has handled more than 1,000 trenchless pipe bursting and trenchless pipe lining projects over the years, and we have the technology necessary to ensure that the job is done right—every time! If you have a plumbing crisis on your hands, we are also available 24/7 to provide you with emergency service. To get a free, no-obligation quote for your trenchless pipe replacement, call us today at (661) 641-4165. The Rooter Drain Expert always advises for any individual to hire a licensed plumber. It is really important that you know the importance of hiring licensed plumbers. The State of California says that anyone who is going to work in a project valued in more than $500.00 must be licensed. Hiring someone who is not properly licensed can cost you a lot of money in worker compensations ( if a worker injures himself’/herself in your property). We will contact you within 30 minutes!